Mark Bittman has long been supportive of the vegan diet and in VB6 he draws a road map for those who want to move to a more compassionate diet for health reasons. I’m also in the midst of reading Veganomics by Nick Cooney, so forgive me if I pepper a few statistics from Cooney’s book as well: Most people become vegetarian or vegan for either health reasons or to help animals. However, people who successfully stay with a compassionate diet adopt more reasons the longer they maintain their diet. For example, if they started out vegan because of the desire to help animals, they’ll stay vegan because they feel it is healthy and they’ll also realize the environmental benefits of their diet, adding these to their list of reasons. My point is that if you want to become vegan to help animals, not for health reasons, Mark Bittman’s book is still a great read. 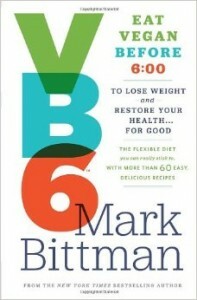 Bittman is compassionate and forgiving of the reader by reminding us that changing our diet is not easy. It involves creating new habits, changing our taste buds, and creating strategies that don’t isolate us from others that may not share our dietary convictions but still want to eat out with us. Even as a lifelong vegetarian that knows the value of cooking large quantities of soup that can be frozen into lunch portions and quickly thrown together stir-fry “recipes,” I found his book delightful. Reading it inspired me to set down the cookies and crackers and do some serious meal planning. I loved his tips on what vegetables you can cut and prepare in advance to make cooking in the evening a cinch (celery and carrots – which also make for great snacking!). I took to heart his advice that ‘if you buy it you will be more likely to eat it and cook it.’ My fruit intake has probably tripled since I started reading this book. There are lots of great vegan cookbooks, but what Bittman did in VB6 is help the reader understand how to switch not only to a vegan lifestyle but also to a healthy lifestyle. I love that all his recipes center on basic easy-to-find inexpensive foods (well, sadly fruit doesn’t always qualify for the “inexpensive” category). And although he does have one chapter on non-vegan recipes (to be eaten after 6 or sparingly), you can always skip that chapter (like I did). Nowhere does he insist that anyone “needs to eat animal products.” The inclusion of that chapter is for those who aspire to reduce the animal products in their diet, but don’t think they can do it full time. I love this inclusive message. As Nick Cooney points out in Veganomics – 10 people who eat only one meal day with animal products have much more significant impact than 5 people who become 100 percent vegan. So whether you fall into the former or latter camp, if you want to eat a healthier plant-based diet, I highly recommend reading VB6.